In 2001, the Milwaukee Bucks played the Philadelphia 76ers in the Eastern Conference Finals. The small-market Bucks did not have any big stars, with Ray Allen as their most popular player. 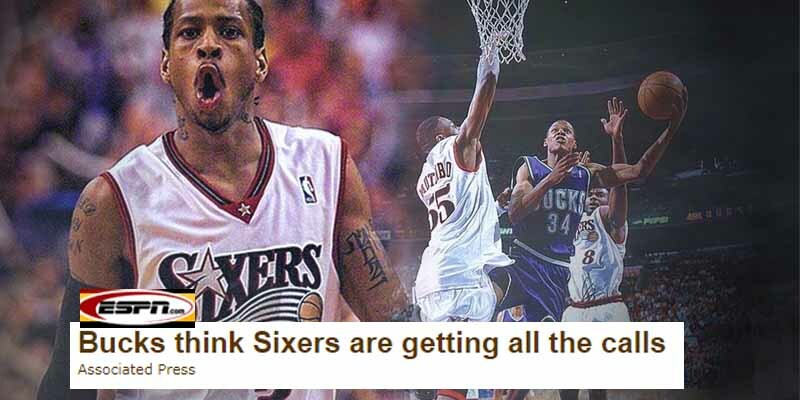 The Sixers, on the other hand, had that year’s MVP Allen Iverson, Defensive Player of the Year Dikembe Mutombo, Sixth Man of the Year award in Aaron McKie and Coach of the Year Larry Brown. The series had several calls deemed dubious by the Bucks and their fans. Glenn Robinson, Sam Cassell and then-head coach George Karl joined Allen in complaining about the officiating and hinting that the league was against them. Karl and Allen were both fined for their comments. In Game 6 of the tensely fought series, Bucks forward Scott Williams threw an elbow at Iverson and was subsequently suspended for the deciding Game 7.